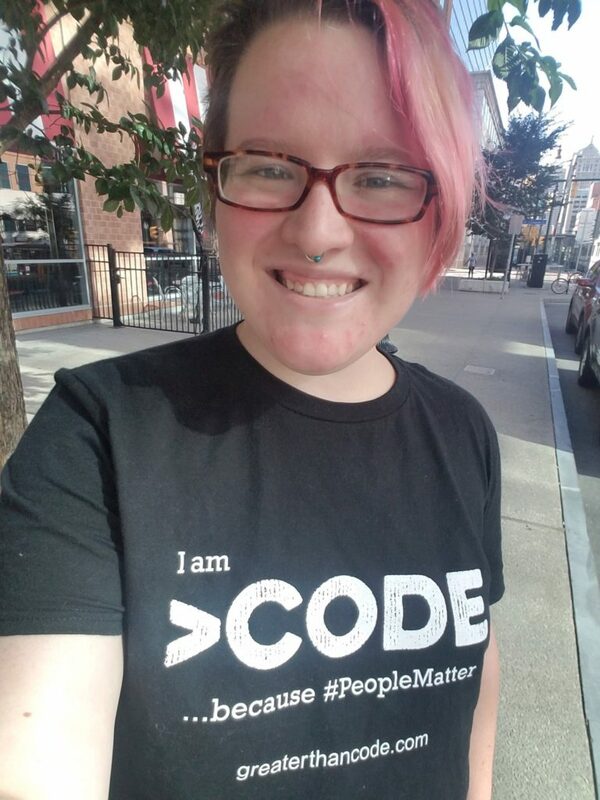 Earlier this summer I was approached with a very exciting proposal from a friend who I met at AlterConf NYC last winter and asked to become a regular panelist on Greater Than Code. I was really honored to have been asked and really excited to get to work closely with a panel of such intelligent, talented and insightful people. If you haven’t heard of Greater Than Code, it’s a podcast that you definitely need to get on your list – and not just because I’m working on it now! It’s a podcast about technology but more importantly, it’s about the humans that are behind the technology we use. We believe that the story of how the people behind the code got to the place they are today is an integral part of understanding the awesome projects that they work on. I believe this wholeheartedly, so that’s part of why I was so excited to be a part of the show. Even as a new panelist, I feel really lucky to have gotten to participate in some really amazing conversations and learned a lot, both from my fellow panelists and the amazing guests we’ve had on the show. So far, my first three episodes as a panelist are available if you’d like to give them a listen! Episode 40: F*ck It and Be Nice featured Jenn Schiffer and Jessica Lord and focused on the way we treat each other within the tech community, particularly on Twitter, and the unfortunate ways that we’ve normalized putting one another down. Episode 42 was about Carina Zona and the work she’s done with CallbackWomen, which has been a really helpful resource for me as I’ve been starting my career as a conference speaker! We talked a lot about what conferences can be doing to make their events more inclusive and inviting to women and other minority genders. Episode 43 is a personal favorite of mine so far and it’s about how accessibility issues affect the designing and playing of board games. We had a really interesting chat with James Edward Gray and Mischa Lewis-Norelle that is highly recommended listening from me! I’ve done work on podcasts before and I really enjoy it but I have to admit that stepping into an already well established show like Greater Than Code has been a really new experience for me! I was handing out stickers at Polyconf last month and it was super interesting to talk to people who already know and love our show, especially before my first episode was even available! I’m really looking forward to being a part of more episodes and events in the future, especially since we have some really good topics coming up! Plus, we’re always looking for more guests and we’re even hoping to add another permanent panelist soon, preferably a woman of color, so if you want stickers or know anybody who’d be interested, please feel free to hit me up! 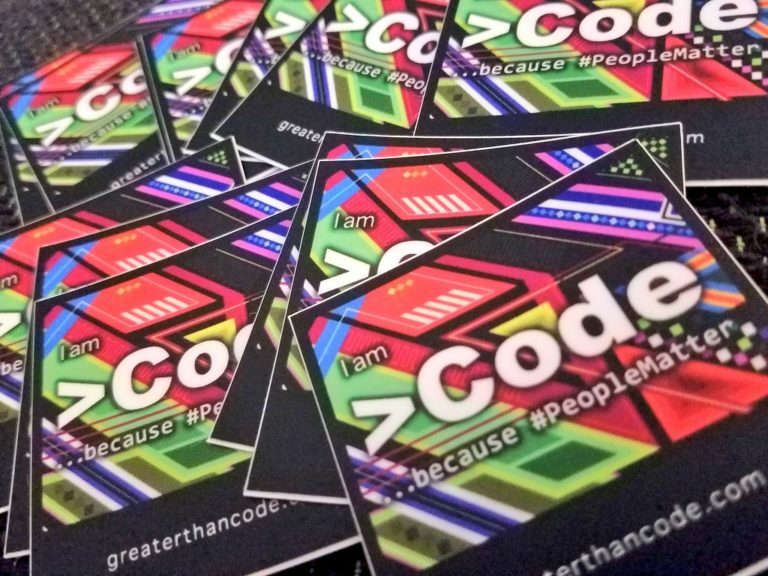 Also, If you like Greater Than Code, please consider supporting us financially! The more support we have on our Patreon, the more awesome things we can make for you and the more often we can release episodes of the show! Also, being a Patron gets you access to interesting, behind the scenes content that doesn’t make it into the show, like a cool discussion about gender signifiers in video games that was had during the break of episode 43. I feel really good that we’re doing good work in the tech industry, but if we want to be able to continue and expand, we’ll need everyone’s help. Thanks!